Buy fresh caught wild salmon. Sockeye salmon won't live in farmed captivity, so it is a good bet. Pulse the walnuts in a mini food processor until finely chopped. Spread them on a plate. 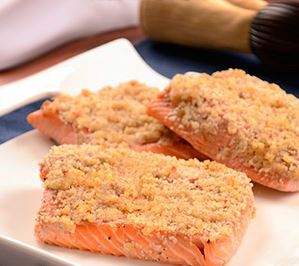 Preheat the oven to 375° F. Use nonstick cooking oil spray to grease a baking dish large enough to hold the salmon fillets in a single layer. In a small bowl, whisk together the honey, mayonnaise, mustard, salt and pepper. Brush the tops and sides of the fillets with the mixture, using all of it. Use tongs or your hands to press the top of each fillet onto the plate of walnuts, making sure to coat it evenly and completely. As you work, arrange each coated fillet in the baking dish, skin side down. Bake for 10 to 12 minutes or to the desired degree of doneness. Serve warm.